When Northern Irish veteran John Murtagh, 91, joined up to help the war effort in 1943 he could never have imagined the adventure and experiences that lay ahead. 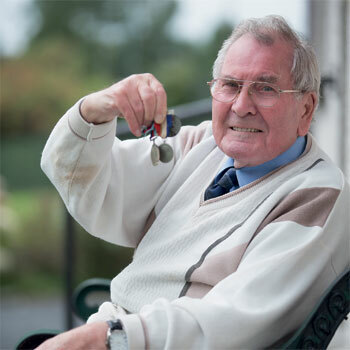 John was part of the Royal Army Service Corps that supported the allied offensive as it made its way across Europe during 1944 and 1945. He landed on Normandy’s Sword Beach shortly after D-Day, advancing through Europe and into Germany, before eventually reaching Belsen concentration camp where he witnessed some of the war’s most harrowing images. He received a grant from the Heroes Return 2 programme to return to Normandy last year, and it proved an emotional experience. “I could see it all,” said John. “I could see the faces of our friends. It was upsetting, but I am glad I went back,” says John, a quiet man who denies he is a hero. John’s war began in the Faroe Islands where he was a Messing Officer, buying in the food and helping load and unload boats and warehouses for forces fighting in Russia. Then in May 1944 he was called back to London to join the allied offensive in Europe. He landed on Sword Beach on June 9, shortly after D-Day. But the celebrations ended abruptly when John arrived in north western Germany in 1945 to help with the liberation of Belsen concentration camp. “I could not describe the smell or the people when we arrived there,” he said. “It was one of the most harrowing things I have ever seen. They had been so badly treated, some were just skin and bone, I don’t know how they survived. The faces were tortured – that’s the best description I can give of it.